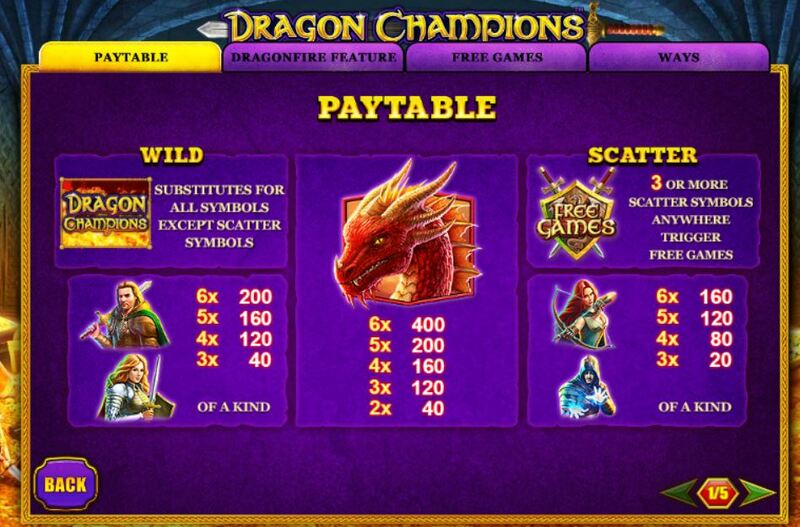 Dragon Champions slot is another Playtech 4096-way game to accompany Buffalo Blitz but a whole lot better! If you like this type of multiway slot it’s a great alternative to Raging Rhino or Danger High Voltage. Like those slots it has stacked symbols and you get scatters on all reels plus Wilds on reels 2 to 6 but single only. The premium symbol is the Dragon and it pays 10x bet for a full 6OAK win so you could theoretically hit 4096×10 = 40,960x bet in one spin! 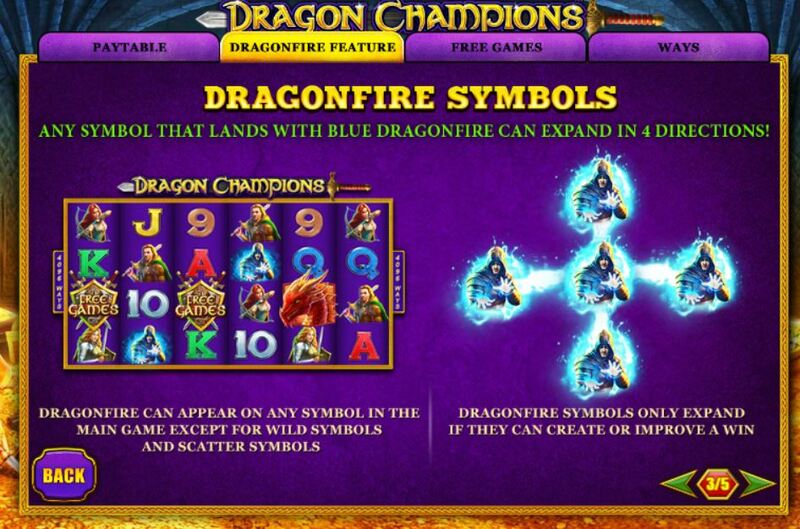 There is an in-play feature on Dragon Champions slot with one or more of the same icon surrounded by a blue flame on any given spin, although it cannot be the scatter, dragon or Wild. If able to form a win, this Dragonfire icon will expand left, right, up and down to form a cross, or part of the cross if the Dragonfire symbol appears on reels 1 or 6 and/or on the top and bottom row. This results even in low-value icons such as the J or Q being able to award big wins for just a 4-reel combination, and you can 2 or more of them in a 5 or 6-reel combination and with the stacked symbol mechanic of the slot this means hundreds x bet can be won from even low icons, thousands for the higher ones. Three or more Shield Scatters awards 8 free spins, you would get 100 for all 6 and retriggers are possible plus you will get 5 extra spins for just 2 scatters too. 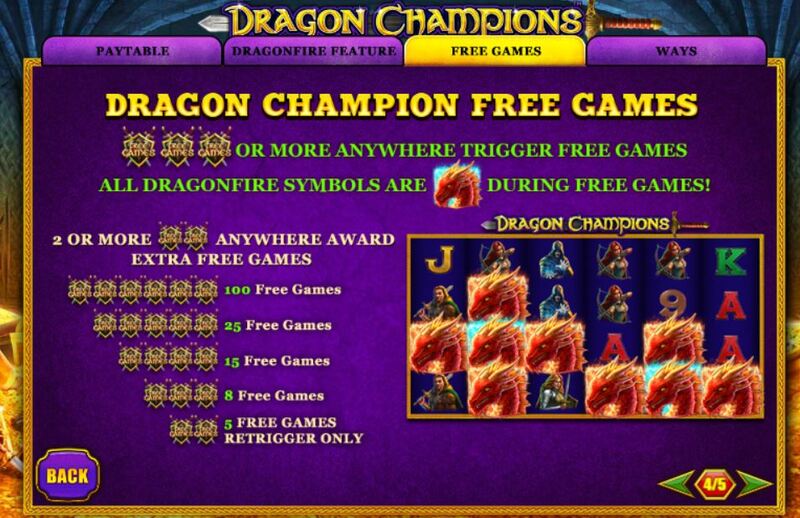 During the free games only the top Dragon symbol is able to be a Dragonfire icon and link these up for some huge wins! More often than not you will see some extra spins or retriggers in the bonus. 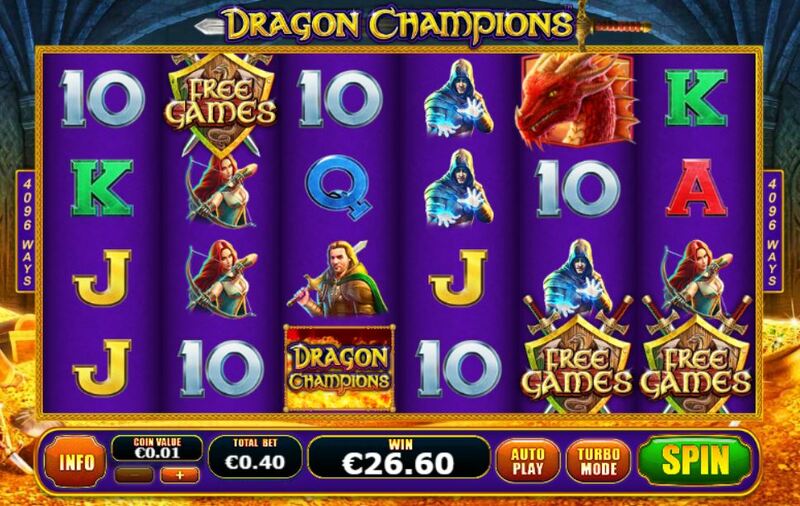 The volatility is medium to high and the RTP of Dragon Champions slot is 95.11%. An excellent game overall.